Christmas, tee shirts in woman’s sizes, loads of very visible bike course referees, etc. As with any race there were a few things which weren’t perfect but overall excellent. Don’t know what the others think? 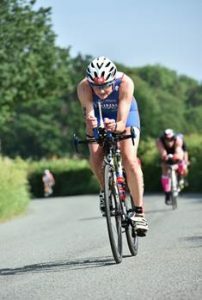 I had a good, but very painful race – first river swim, it’s not me in the photo, good bike spoilt by an impressive tangle on the dismount line when I tried to fit through a gap that wasn’t there and took myself and two others out. They were incredibly polite! Then the run from hell, but can’t win them all. pb and cracked the 5 hour 30 barrier for a half. Great day out, Chester is very pretty, recommend.